One thing is clear, if nothing else: there are people who will say anything to promote the lone assassin theory, writes Milicent Cranor. If you ever want to witness a crime with your own eyes, you need only look at certain pages of the official record on the murder of John F. Kennedy. The crime is perjury. But unless you know a great deal about the case, you may not recognize it. There is, however, another crime scene you can visit that is easier to evaluate. Here, the crime is fraud, six pounds of it: Reclaiming History, by Vincent Bugliosi. If this is how Bugliosi reports simple, physical information, imagine what he does with more complex issues. Was the wound in Kennedy's throat an entrance or an exit? The wound itself can no longer tell us. No samples of the perimeter of the wound in the skin were preserved on slides. The only known photos of the wound were taken from too far away and are of poor quality. Words describing the wound have been preserved, but often they can be used to fit either situation. Exit wounds can be small. Entrance wounds can be slightly ragged, or show "tattering" (Journal of Trauma 1963 (March) 3(2):120-128.) But words describing the little irregularities along the border of a round wound should not be confused with words indicating a jagged or star-shaped (stellate) wound - i.e., a typical exit wound. You will never learn of these ambiguities in Vincent Bugliosi's book. Bugliosi wants you to believe that (a) the wound was "ragged," and (b) this proves it was an exit. You will not learn from Bugliosi that the majority of Parkland doctors said the wound was not ragged. What is more seriously deceptive is that Bugliosi put these words -- "ragged edges" -- into the mouths of doctors who in fact said the opposite. Reference 1069 only documents Humes's questionable claim that, from Malcolm O. Perry, he learned for the first time JFK had a bullet wound in his throat. But Perry never told Humes or anyone else that the wound had "ragged edges." Bugliosi's reference for the above is page 517 of the Warren Report where Charles J. Carrico described a "ragged wound of the trachea," (emphasis mine). Yet, in the above context, Bugliosi seems to want the reader to assume "the wound" refers to the one in the skin -- the only kind that counts in the context of entrance versus exit. (Almost any wound in a trachea would be ragged because of the stiffness of cartilage.) Elsewhere, in a different context, Bugliosi mentions Carrico's description of the raggedness of the trachea (Bugliosi, p.60), and so it is unlikely that he has confused this with the wound in the skin. Significant omission: The reason given by Ronald C. Jones, quoted above, for believing it to be an entrance wound: "relatively smooth edges." (6 WCH 54) After discrediting the ability of these doctors to determine whether the wound was an entrance, it does no good to provide their opinions without the reasons underlying those opinions. When it came to reporting physical details of the wound, Bugliosi omitted what the majority -- four of six doctors -- had to say, the same four whose words could not be used to suggest the wound was an exit. The only definitive way to determine the nature of an ambiguous wound is to examine it under magnification. Bullet holes in the skin, as in the skull, have a pattern of "cratering" that reveals their nature; the dermis and epidermis tell the same tales as the inner and outer tables of the skull. (Jones, Nancy L. Atlas of Forensic Pathology, New York: Igaku-Shoin, 1966, p.77) And there are other microscopic signs. The pathologists who performed JFK's autopsy claimed they were unaware of a wound in the throat until the next day, after the body was taken away. Consequently, as far as we know, they never looked at this wound under magnification. Bugliosi has, however, put the word "ragged" under great magnification and declares it "a sure sign of an exit." The Clark Panel and HSCA claimed they could determine -- from poor quality photographs taken at a distance -- the nature of Kennedy's throat wound. Although Bugliosi is a layman, one would think he would notice an absolutely stunning omission from the reports of both of these investigations: reasons for their conclusion that this small wound, so typical of an entrance even to the naked eye, was an exit. Those reasons would necessarily have to be subtle. Where is the requisite list of details that distinguished this "exit" wound from an entrance? Not one of the specialists on either medical panel followed the principles as stated by the most prominent member of the Clark Panel, Alan R. Moritz, M.D. From his article, "Classical Mistakes in Forensic Pathology," American Journal of Clinical Pathology 1956; vol.26, p.1383. "Although it would seem to be obvious that the location, dimensions, shape, depth, and special features of every wound should be described, such information is frequently inadequately recorded on protocols that are prepared by pathologists who perform only occasional medicolegal autopsies." And this is exactly what the Clark Panel and HSCA did with respect to the throat wound: "substituted an interpretation for a description." The hole in the front of the governor's shirt was large, no doubt due to exiting rib fragments, but the hole in the front of the jacket was created only by the bullet, and the small size of this hole indicates the bullet exited straight on, i.e., not sideways, and thus it was not tumbling. Why would Bugliosi lie about the hole in Connally's jacket? Why would he want it to appear as though the bullet had exited tumbling? The alleged tumbling is allegedly caused by the bullet's alleged journey through JFK. The alleged tumbling is allegedly associated with the outward movement of Connally's jacket lapel. According to the questionable experiments described below (and referenced in the Bugliosi quote above), only a tumbling bullet can push out rib fragments to the extent that they cause the lapel to flare outward. Background. The false evidence concerning the actual size of the hole in Connally's jacket was manufactured by the late John K. Lattimer, M.D., a well known urologist with powerful connections who wrote several articles, all hard sell and soft science - informercials, really -- that promoted the many aspects of the lone assassin theory. Lattimer's disinformation on the ballistics of the single bullet theory was based on experiments using mock-ups of Kennedy and Connally (reference #4 below). 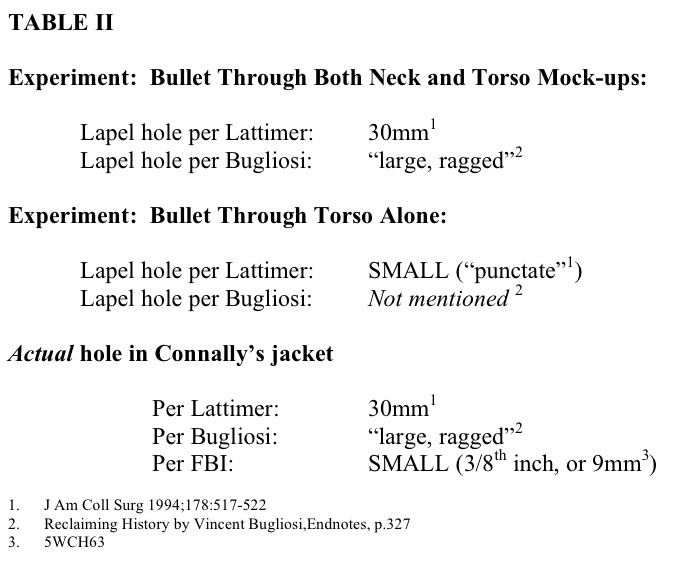 Lattimer presumably shot Carcano bullets through these mock-ups, then presented various bits of data from the experiments, including the size of the mock torso's back wound, and the experiment's jacket lapel -- both used to prove the bullet was tumbling. Lattimer put together crudely deceptive exhibits designed to sell the public on the size of Connally's back wound. Please see my illustrated essay "Big Lie About a Small Wound" at www.historymatters.com. You will not find this particular lie in Reclaiming History. Bugliosi and I have a mutual acquaintance who quietly implied that people working for him have seen the article and, for that reason, stayed away from this more obvious fraud. I have no way of verifying this behind-the-scenes story. Significant omission: Not one word from Bugliosi on the size of the hole in the front of the jacket used in the experiment. Readers of Reclaiming History would have to do a lot of digging into primary source material to discover Bugliosi lies, revisions, and omissions. It's interesting that the facts that Bugliosi tried to hide could actually be used to show that Connally was shot by a separate bullet, but there is glaring evidence the experiments were rigged: How could Lattimer's mock-up of a "neck" cause a bullet to tumble, while the thicker "torso," complete with ribs (one of which was hit by the bullet) did not interfere with the bullet's flight at all? Michael M. Baden, M.D., at the time, Chief Medical Examiner, New York City, and Chairman of the HSCA Medical Panel, was one of Bugliosi's main sources of interpretation of the medical evidence, mentioned in the book no fewer than 92 times, including references -- and is himself a specimen. Before you take what he says seriously, no matter how authoritative it sounds, you should take a good look at what he is capable of. You have heard the expression "stretching the truth," but here is an instance of stretching a lie. In this case, the lie he stretches came from John Lattimer. (See above section, and, for more details, see "Big Lie about a Small Wound" at www.historymatters.com. As mentioned earlier, Lattimer doubled the length of the back wound (from 15 to 30mm) so that it matched the length of a Carcano bullet. Baden, knowing that the wound's scar had to be larger than the wound itself, revised what he reported earlier - and doubled the size of the scar! Two inches versus one and one-eighth. Quite a contribution to the single bullet theory. How could Bugliosi trust anything Michael Baden says about anything? The damage to John Kennedy's head remains as mysterious as the dark side of the moon. Too many revisions in the evidence, and too many pseudoscientific explanations for these revisions, make it impossible to know what, or whom, to believe. The word "discrepancy" is inadequate to explain the extreme contrast among some of the different versions of the wounds. First, it was Parkland (large defect representing an exit wound in the rear of the skull) versus Bethesda (entrance wound in the rear); then it was Bethesda (entrance low) versus the Clark Panel and HSCA (entrance four inches higher); then it was Parkland 1963 (large defect in the rear) versus Parkland 1990's (didn't see any defect; misunderstood what they saw), and so on. The Parkland doctors in Dallas, including the Chief of the Division of Neurosurgery, William Kemp Clark, described a large defect in the bone at the right rear of the head, evidence of an exit wound they thought -- from a bullet fired from the front. Dr. Clark and others defined the types of bone along the perimeter of the hole and noted that some of the bone was "avulsed," that is, thrust outward. Inside and out, they saw both cerebrum and cerebellum (brain tissue with distinctly different texture that lies below the cerebrum). Cerebellum (unlike ubiquitous cerebrum) exuding from the defect was considered strongly suggestive of an exit in the rear. Dr. Clark did not record his observations for merely academic reasons. He had to look carefully into the defect to assess what was left of the brain in order to make a decision on whether to stop resuscitation efforts. He did not try to assess the full extent of the defect. Late in the evening of the autopsy, three skull fragments, found in the limousine, were delivered. One of those fragments presumably fit into the defect in the rear of the head. It had a semicircular notch on its edge, said to be part of a hole created by an entering bullet. Now consider the location of the completed bullet hole: the pathologists said it was "just above" the EOP (external occipital protuberance) a landmark bump -- low in the rear of the head. This necessarily means that the defect - and the fragment that filled it -- also had to begin low in the rear of the head. Gary L. Aguilar, M.D. has proven, with great elegance, that what Bethesda reported was not so different from what Parkland reported: a large defect in the rear of the head. Please see How Five Investigations Got it Wrong at www.history-matters.com He was the first to report the significance of the pathologists' measurements of the defect and the fragments -- what these figures meant with respect to the damage in the rear, and what Parkland had reported. The language used by the pathologists was vague. They said the defect was "somewhat" into the occiput while emphasizing the damage in the front of the head. And their diagrams suggested the bullet hole was much lower than the lowest edge of the defect. (They explained that the diagrams only showed the hole in the scalp as opposed to the bone underneath.) The main Parkland-Bethesda controversy then is not whether there was a defect in the rear - there was -- but whether a bullet entered, or exited, from that area. Getting back to Dallas, in the 1990's, some of the Parkland doctors said they never saw any defect; they said the back of the head was hidden by a curtain of gore-drenched hair that misled them into thinking a wound was under it. They also revised what they said about the brain: what they thought was cerebellum was just damaged cerebrum. There is a big problem with this explanation: these doctors also reported seeing damaged cerebrum, tissue which they did not mistake for cerebellum. Obviously they made a distinction between the two. And some of the exposed cerebellum was sufficiently intact to exhibit grossly visible, definable characteristics. Dr. Clark, a distinguished neurosurgeon and the most qualified of all the physicians who saw the head damage, never changed his story. Michael Baden, to whom Bugliosi often turned for advice, has also made good use of the hair-curtain explanation. He used it to explain how on-lookers at the autopsy could be so "wrong" about the greater defect in the skull. He even used it to explain why the pathologists were "wrong" about where the skull entrance wound was. Baden gives new meaning to the expression "pulling the wool over one's eyes." Few medical professionals would be fooled by such an explanation. Anyone who has dealt with trauma knows that even the least serious little wound in the highly vascularized scalp can cause a great blood bath. Even brain injuries can look worse than they are. Doctors and nurses always look under the mess for its source. Another source of the controversy: an object on the skull X-ray (frontal view), presumed to be a bullet fragment. The pathologists, the acting radiologist, and other autopsy witnesses described the largest fragment as just a sliver, shaped like a matchstick, located in the front of the head, right behind the right eye. They confirmed its location in the brain, and extracted it. Below you will find a few specimens that reflect Bugliosi's attempts to deal with these controversies. There are many more that I have not reported for lack of time. It is not likely the typist mistook "cerebrum" for "cerebellum." Individual parts of the cerebrum were listed: the right parietal lobe, the right frontal lobe, the left fronto-parietal cortex -- all parts of the cerebrum. The pathologists clearly described both types of brain tissue. It is standard to mention all normal parts of an organ adjacent to the abnormal parts, and the exclusion of the cerebellum from the Gross Description of the Brain, and its inclusion in the Microscopic Examination, is intriguing indeed. As Bugliosi reports, several other Parkland doctors revised their statements, but I repeat: there is a big problem with this explanation. These doctors also reported seeing damaged cerebrum, tissue which they did not mistake for cerebellum. Obviously they made a distinction between the two. Some of the exposed cerebellum was sufficiently intact to exhibit grossly visible, definable characteristics. (And it is strange that Bugliosi gives credence to anything said by Marion T. Jenkins, considering this doctor's ability to confabulate. For details, please see my essay, "The Wandering Wounds," at http://www.assassinationweb.com/cranrev.htm. Hair Hides Wound from Parkland? Hair Hides Wound from Autopsy Onlookers? A small hole revealed by shaving the scalp is probably the one thing observers at a distance would not be able to appreciate. But these onlookers observed the scalp being reflected back to show the damage in the actual bone. Some described the brain being removed, and made other very specific observations that were based on a view of naked bone. (These witness statements have been reported so extensively by so many researchers I shall not repeat them here.) Baden apparently wishes to imply these observers saw not much more than what shows in the gory, messy photos taken before the autopsy began. Ridiculous as the comment in Specimen 15 is, Baden has topped it! See next section. Hair Hides Wound from Prosectors who Performed Autopsy? As Baden knew very well, the pathologists folded back the scalp to observe the skull directly and, they said, they looked at what was left of the hole from the inside of the skull. Bugliosi admitted there were "errors" in Baden's book, and he mentioned a few, giving the greatest space to the one concerning Pierre Finck's background. Baden had said, falsely, that Finck had never performed an autopsy on a victim of a gunshot wound before. But Bugliosi never mentioned the two outrageous assertions from Baden's book that I have quoted in this essay. And the excuses he makes for Baden are just not credible. "Detail." The "errors" that are the most embarrassing - the ones Bugliosi does not mention -- do not concern "detail." They are assertions concerning facts and logic treated as linchpins in proving the lone assassin theory. "An extremely busy man." The chapter on the Kennedy assassination was quite small -- just a few pages long -- in a small book. Baden was too busy to review statements made in his name on the Crime of the Century? (Maybe he had hair in his eyes and couldn't see the print?) "If I were to wager." As if he had to guess. As if Baden were not available to ask directly. Considering all the direct personal contact Bugliosi had had with Baden as documented extensively in this book, you would think Bugliosi would have asked Baden himself about all of these strange statements. But, then, maybe they both were too busy. Many of us are skeptical about the authenticity of the skull X-rays because what they show is just too different from what was described by the closest and most qualified witnesses. We are especially skeptical of the shiny new fragment - the perfect slice of a 6.5 Carcano bullet - that no one reported in 1964. David Mantik, M.D., Ph.D., a radiologist and physicist, has provided highly technical reasons for believing the X-rays are counterfeit. Bugliosi cannot deal with these concepts, and turns to wound ballistics expert Larry M. Sturdivan (BS in Physics, MS in statistics) and Dr. Chad Zimmerman for help in rebutting Mantik's theories. What Zimmerman said about the fragment itself contradicts the opinion of the HSCA's expert radiologist. According to Gerald McDonnel, the HSCA expert radiologist, the metal fragment was imbedded on the inside of the scalp (7 HSCA 133). If McDonnel is right, it could not have been "stuck in the hair or on the skin" as Zimmerman muses. In any case, this does not explain why no one, including the acting radiologist at the autopsy, saw this obvious fragment on the X-ray. As for his opinion on what makes a forgery, what are his qualifications? Chad Zimmerman has provided Bugliosi and others with his opinions on several aspects of this case - ballistics, acoustics, neurology, radiology and photography, all promoting the lone assassin theory. He does not provide references from scholarly sources for his opinions; does this mean that he himself is a recognized scholarly source? With all due respect, who is Chad Zimmerman to disagree with Gerald McDonnel? He is a Doctor of Chiropractic. (Bugliosi, Endnotes, p. 327) According to his advertisements, he offers massage therapy. This case has had quite enough massage therapy. One thing is clear, if nothing else: there are people who will say anything to promote the lone assassin theory. It would be nice if you could just cast aside all the words and look at the images, the X-rays for instance. But here, again, you need words - the words of the people who authenticated them. Would McDonnel et al have the sophistication the spot the signs of a sophisticated forgery? Who is qualified to do that? The very people who have the expertise may be the least credible, considering their close association with the government. The relationship between Kodak and the often deceptive CIA is well established. Would they, too, say anything, true or not?